How do women become so wise and resilient? And why do we sweat the small stuff so much? Is there some balance, some moment when you realize that most of it is all small stuff? 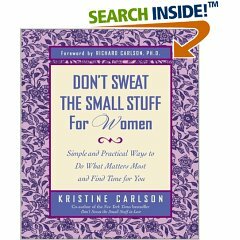 Kristine Carlson is married to Richard Carlson and together they show great insight into the everyday life. Their books can seriously start to change your life if you use the principles they present in these easy-to-read compact books. I especially like their "Don't Sweat the Small Stuff in Love" book and I think it helped me improve my own relationship considerably by making me realize that one of the most important needs humans have is to be listened to. I had never really thought about what the other person needed in conversation, always so busy jabbering on. Wow, that was quite a revelation to me and it changed my entire view of conversation. Expect real revelations from these books. They are more than enlightening. Sometimes a simple awareness of an issue can trigger an entire thinking pattern that will help you make changes. When reading this book a highlighter is essential! Kristine discusses why you should set aside time every morning to reflect. See, that is a good excuse to spend a little time in the morning chatting online? Right? Ok, well I think that she actually meant spending time alone thinking about your day. As you move into your day, you try to get organized and at times the entire day feels like it is falling apart. Have you noticed that if you pick up the house in the morning, the entire day is more enjoyable? Kristine gives herself an hour each morning to clear the path of her day. She spends time each morning organizing her life. I loved her thought about laundry. A gentleman she met makes folding clothes a Zen meditation. Ok, so I am not burning candles while I fold towels, but I try not to be as stressed about it all. Make Peace with The Mundane - Sometimes life just IS. Ground Your Energy in Nature - Take a walk in the evening. Protect Your Inner Flame - Nurture yourself. Plan an Inspiration Flow Day - Just go with the flow...oh, what fun this type of day is. It is very freeing and you do just what occurs to you. I write the most reviews on these types of days. They might include reading a great book, watching a movie, sitting outside with the cats, making dinner, writing in a journal, exercising. On other days, you might feel like just leaving the house for most of the day and forgetting about that load of laundry, those dishes, etc. Just escaping can be most freeing. Walk Through Open Doors - A positive attitude shows you more open doors. Let Go of "Perfect" Plans - have a sense of humor when things don't work instead of crying your eyes out. Disappointment is so hard to take when you have very high expectations. Climb Your Mountain One Step at a Time - set goals, but take it one step at a time. This is a collection of essays that will inspire you and you will learn to appreciate people in your life, swallow your anger, take time for yourself and nurture your friendships. Use this as a way to make your own list of things you want to change in your life. Define what is not really important then imagine it drifting away on a small boat, down the river in front of you. After all, who has time for all that baggage. Read this book to help you see the really important things in life. Creating Magic in Midlife is Karla Freeman's gift to anyone looking for answers as they enter a new stage of their life. Karla Freeman's vibrant and encouraging writing style creates a nurturing environment for anyone wishing to avoid a midlife crisis. Helpful questions draw attention to enlivening moments, as readers are encouraged to discover their true heart's desire. Is it too late to improve relationships? How can you begin a new career? What does it take to handle drastic changes? Can you still satisfy your deepest longings after 45? Can a crisis become a moment of spiritual awakening? The 101 questions and answers focus on ages 45-70, but anyone over 35 will find a wealth of wisdom in the life evaluation sections. Health, finances, energy enhancement and even a brief explanation of Ayurveda keeps the writing fresh and enlightening. Ideas about walking to sort out emotions and suggestions for maximizing endorphin release gives this book a practical side. There are ideas for healing vacations, unique sections on menopause and she even discusses the issue of how we become stressed about trying to stay healthy. Isolation, Transference, grief ritual retreats, working from home and healthy living to prevent memory loss is also discussed. Karla Freeman draws on her life experiences and well-read life to explore ideas about why a balance of work and love leads to a healthy life. This book may be the perfect starting point for a journey into your soul's deepest desires. 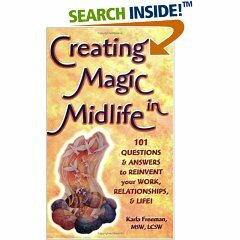 With numerous book suggestions throughout, Karla Freeman succeeds in not only creating an environment of support, she encourages further reading into areas that will be especially helpful for anyone wishing to avoid a midlife crisis as they embrace the ideas in Creating Magic in Midlife. When I think of anger, two things come to mind. Being emotionally abused by someone who is angry and being angry enough to change the situation. In many cases, my own anger in return just makes situations worse, especially when maintaining the relationship and allowing the angry person to repeat the abuse. Without peaceful consistency, I experience conflict and disorder as if what is occurring inside is represented on the outside in my environment. Leading a well-organized life where everyone is pleasant and kind seems a dream. That is why the title of this book is slightly more than intriguing. Normally one assumes that the path to peace is love and understanding. Anger lashes out and is hardly an appealing cozy hug. John Rifkin sees anger as a path to a more fulfilled life. He explores the reasons we "develop holes in our heart" and then gives practical ways we can deal with our thoughts, feelings and behaviors. He delves into the emotional damage you may have experienced while a child and examines anxiety (PTSD), mood disorders, depression, bipolar disorder and ways we misuse our anger. Chapter Seven contains helpful information about resolving conflict in relationships and how to improve communication skills. Is anger a wake up call? Could you be anxious and angry because you have made choices that are harming you? Does anger help you to break out of complacency and change your life? What are the seven categories of emotional damage from childhood? Category six started to sound very familiar. John Rifkin discusses anger on the entire scale of expression, from angry red anger to passive-aggressive anger. He also explains why Emotional Intimacy is one of the most difficult things to accomplish. I liked his ideas about identifying low self-esteem and why anger often takes the form of self-destructive behaviors. He explains why individuals can seem to be emotionally unaware and why people who are depressed often find themselves in a downward spiral. Is there hope and what can be done about depression and anger? If you are interested in anger and want to understand why you react or the basis for the reaction, then this is an excellent place to start. This book is very much about learning to communicate effectively so you can use milder feelings of anger to solve the problems in your life. 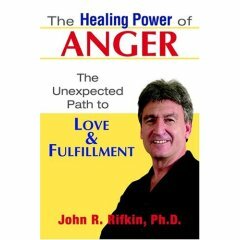 John Rifkin has truly written a book to help us understand anger from a variety of perspectives. I actually started reading this book when I was quite angry and by the time I finished, I felt like finally someone understood! Highly recommended to anyone experiencing anger, conflict in relationships or a general feeling of frustration, anxiety or even deep depression. If you think you may be bipolar or know someone who experiences wide mood swings, this book can help you understand bipolar disorder. This book would also be an excellent resource for social workers, psychologists and counselors. Throughout this book there are numerous case studies. The Healing Power of Anger addresses all the shades of anger and how it can lead to depression, addictions and on the flip side, could help you overcome both. Anger is a very damaging emotion. It could lead to your death or the death of someone you love. This is especially true when someone experiences out-of-control anger and they express their emotions physically. 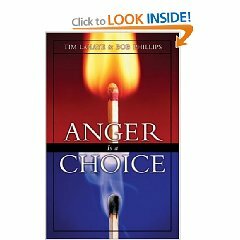 Tim Lahaye and Bob Phillips explore all the ways anger manifests itself in society (media rage, school rage, sports rage) and briefly talk about how anger appears in more subtle forms like resentment and in body language. To be honest this book is the most detailed account of anger I've ever read. There are also some excellent practical techniques for dealing with strong emotions. One of the most interesting parts of this book is the section on how the four basic temperaments deal with anger. You will instantly recognize yourself or someone you love. In the end "Anger is a Choice" is not about never feeling anger again it is about learning to deal with anger in a positive way. One of the things I've found most helpful in regard to anger is to immediately do something positive for the person you are angry with. In combination with conjuring up a feeling of love and forgiveness this will dissolve any anger you may have. It seems to me that love and negative emotions cannot reside in a body at the same time because love takes over. Negative emotions can also obviously ruin your health so they are to be avoided at all costs. If you are struggling with anger then this book will also give you advice on how to find a good counselor. While the ideas in this book may be effective enough to get your anger under control there is something to be said for having someone to talk to about what you are feeling. 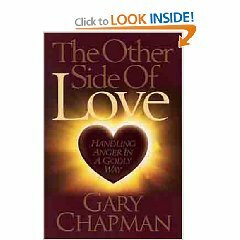 Gary Chapman won't tell you how "not" to get angry. Instead he tells you how to deal with it once it has occurred. From my own reading anger is one of the seven deadly sins and a sign of spiritual maturity is not to get angry at all but to show love. Gary Chapman doesn't think anger is a sin but instead explains the damage anger can cause once it is out of control. At that point he believes we are sinning. He also believes that anger is the opposite of love while most people believe the opposite of love is fear. Even though I don't get angry very much myself anymore I found this book helpful as it describes how to deal with an angry person. I used to be angry more but I learned that you can stop feeling angry by being more patient and forgiving. This is discussed in this book and there are step-by-step instructions for dealing with a potentially dangerous emotion. There is a chapter on how to teach children to deal with anger and a chapter on how to deal with anger in marriage. Most of the examples given seem to be about couples in conflict. For the most part this book has helpful advice even though I think the ultimate goal is not to feel anger at all. So if you feel a lot of anger a lot of the time know that there is help in sight. This book will teach you how to deal with your anger and from my own struggle with anger for over ten years I can say that the steps given do work. I had to learn them on my own because I never thought of reading a book on anger. P.S. A while after I reviewed this book I had an argument with someone that made me slightly upset and maybe a tiny bit angry. So I immediately decided not to be angry and to do something loving (I made the person some doughnuts). As soon as I did that the anger disappeared. It was great not to have to continue to feel like I'd been wronged. So forgiveness and love work!